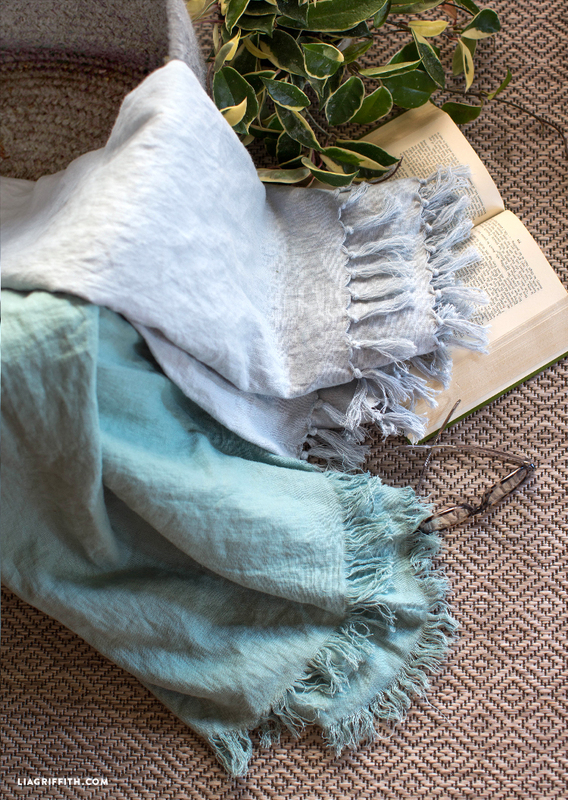 Stay Warm on Summer Nights with This DIY Linen Throw! Linen is quite the trend this year (#EmbraceTheWrinkle). It’s always been a favorite fabric of mine, so I was inspired to use it to make a DIY linen throw. 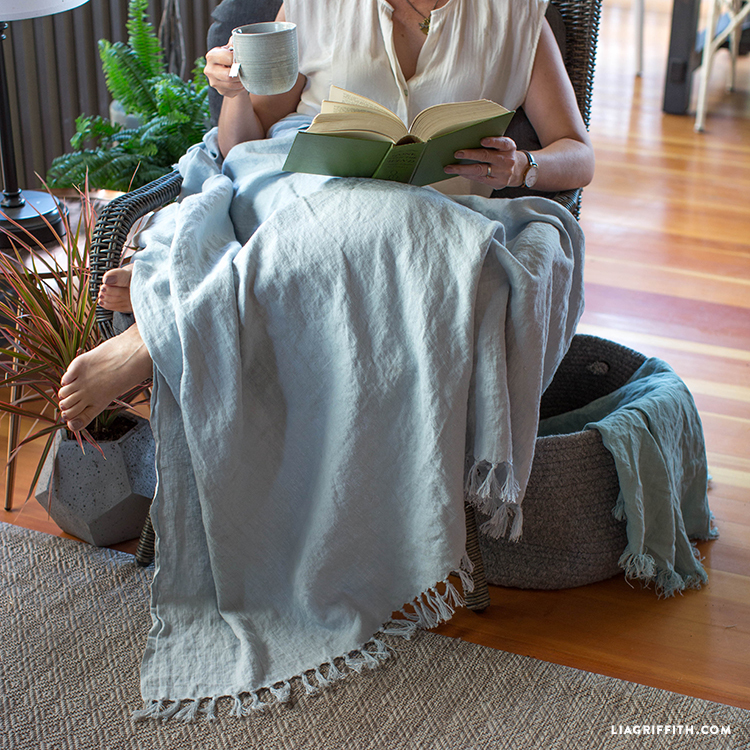 This simple DIY blanket will keep you warm enough during those summer evenings and breezy mornings. You can throw it over your PJs, your favorite dress, or your coziest sweater—and you’ll still look and feel stylish! We have two versions for you to try: one that’s simply frayed around the edges and one that’s frayed on the ends and tied into tassels. For more warm and cozy DIYs, check out our other blanket crafts. Or, if you’re ready to embrace the wrinkle and make your own linen projects, head this way to browse our tutorials. 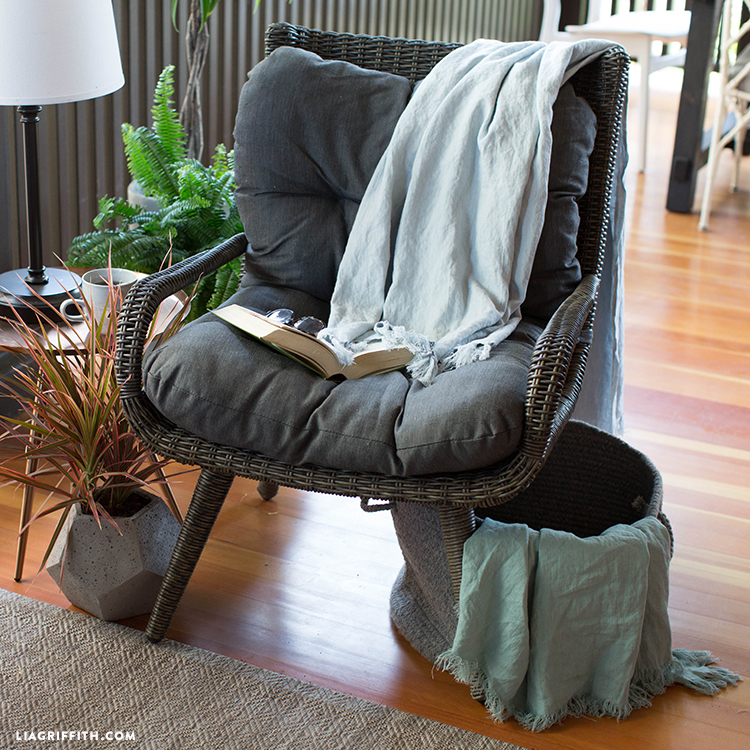 This DIY linen throw is easy-breezy to make in just a couple hours! Gather the tools and materials from our friends at fabric.com, then follow the simple steps below. Happy crafting! P.S. You can find the chair you see in this picture at Hayneedle. Trim each end of the two yards of linen straight along a horizontal thread line. Wash and dry your linen pieces, allowing the ends to fray. Pull off the loose threads on each end. With your seam ripper, gently loosen the threads on the edge of the blanket and remove to create fringe. Continue to remove threads to create a 2–4-inch fringe at top and bottom of blanket or on all four sides. For tassels, gather one inch of fringe and carefully loop into a knot. Continue across both sides of blanket. You can wash and dry your blankets again and again. We’re here to help you explore your creativity with daily inspiration, downloadable cut files, and printable templates that make crafting fun and simple. But we’re also inspired by you! Connect with us on Instagram, Facebook, or YouTube, and share what you’ve been up to with the LGM community by using #MadeWithLia. Want access to our full library of DIY project tutorials—complete with pattern downloads and instructions? Become a member! Head over to our membership page to see our two membership options and a list of benefits for each one. Thanks for a great idea. My linen stash is a little over full and these would be perfect for my deck in the evenings. I am wondering if I could just leave the salvage edges intact and fringe only the cut ends? Just finished my blanket and was wondering how long to leave the tassel threads? Yay! We leave ours around 4″ long. So sophisticated! I love it! 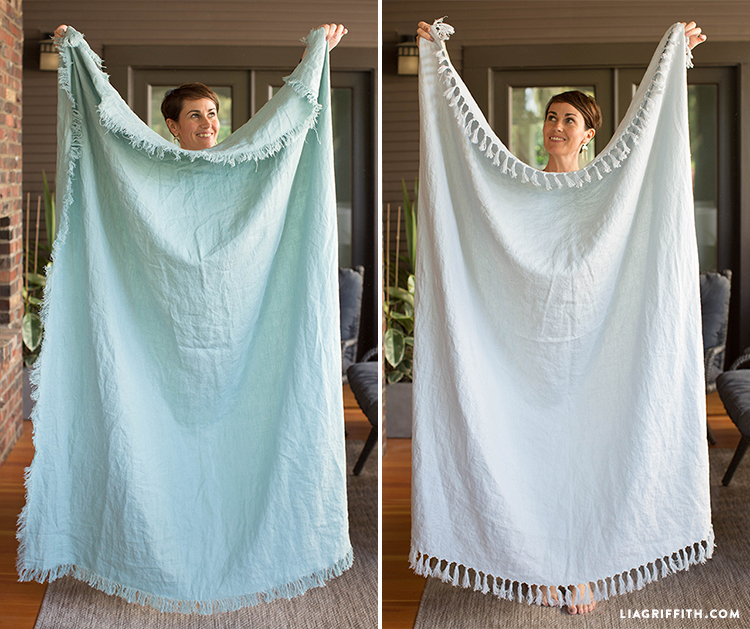 But are the two pieces of linen attached in some way, or is this tutorial for two separate blankets? Thanks Jessica! No, it’s just one piece of linen with 2 different ways you can finish the ends 🙂 We made a couple of each!